As an expectant nation prepares for a classic Super Bowl match-up on Sunday, the defining narrative has returned to the iconic battles playing out on the field rather than side issues such as race relations and concussion. I well remember watching Super Bowl XXXVI at my sister’s house in Boston on February 2, 2002. It was a memorable game for many reasons. It was the first Super Bowl post-9/11 and the season had been extended as the games over the weekend after the terrorist attacks had been postponed. Half-time entertainment was provided by U2, and the Irish band’s iconic song Where the Streets Have No Name was emotionally accompanied by the names of all those who died during the attacks scrolling down the screen. Almost 40 years earlier, the league was criticized for going ahead with games the weekend after President Kennedy was shot dead in Dallas. The authorities wanted to provide something to take the nation’s mind off their grieving. Others considered it disrespectful and inappropriate. It reminded you that the National Football League is a temperature gauge for America, representing the very heartbeat of the nation. And it remains the biggest show around to this day, even after several significant reputational ups and downs along the way. That February day 17 years ago was also iconic for the New England Patriots, as the franchise’s hard-fought 20-17 victory over the St Louis Rams, sealed by a late 48-yard Adam Vinatieri field goal, was the team’s first Super Bowl crown in its history. It was also the first time the viewing nation really got to know a young quarterback by the name of Tom Brady. Established starting Patriots’ QB Drew Bledsoe had been injured early in the season and had to sit out the remainder of the campaign. His career never really recovered, while Brady went on to become the much-loved icon that he is today - or much-hated depending on your sporting allegiance. As we welcomed the team back to Boston after the Super Bowl with well over a million other folks, in biting cold weather, it seems quaint now that the players paraded through town on the backs of trucks. You could almost reach out and touch 24-year-old Brady, Vinatieri, coach Bill Belichick, owner Robert Kraft and their colleagues who had brought the first Bowl to an iconic sporting city. The revitalized town’s first baseball World Series followed soon after, in 2004, for the Boston Red Sox. It broke the "Curse of the Bambino," which stemmed from the failure of the team to win the World Series since 1918, after the Sox sold their iconic star pitcher Babe Ruth to deadly rivals the New York Yankees in 1919-1920. Sport is all about storylines like this, and this year’s Super Bowl is no different. The Patriots’ 2002 opponents, the St. Louis Rams, were previously known as the LA Rams, and they subsequently returned to the City of Angels to resume their history under their previous branding. In a twist of fate, the Patriots are up against the LA Rams in this year’s renewal of the Super Bowl. Now 41-year-old Brady comes up against Jared Goff, who at 24 is the youngest quarterback to win the NFC championship - the same age as Brady when he won his first ring. Rams coach Sean McVay is just 32 years old himself, less than half the age of his opposite number Belichick. It’s a classic "old versus new" matchup, and sums up the resurgence of the NFL this season after a very rocky time in the previous 18 months. There is an exciting clutch of new young stars such as Goff, Rams defensive lineman Aaron Donald, and Kansas City Chiefs’ QB Patrick Mahomes. The games have opened up this year, become more entertaining, and high scores are commonplace, replacing the slightly dreary tactics more redolent of the season prior. Viewing figures are back up, the controversy over players taking a knee during the national anthem to protest racial inequality has faded for now, and the sport’s concussion problem has taken a back seat, although likely only for a little while. It was definitely a good time for the NFL’s new SVP of communications and public affairs Jon Schwarz to join the organization from NASCAR, reporting to EVP Jocelyn Moore. As previous EVP of communications at the NFL, Joe Lockhart, told delegates at last year’s PRWeek Conference in Chicago, the NFL has traditionally been "the ultimate purple institution" that attracted fans of all political persuasions in their shared love of the sport. There was virtually no political controversy in the NFL until 2016, when San Francisco 49ers QB Colin Kaepernick began getting down on one knee during pregame renditions of the national anthem in protest at police brutality against black Americans. President Donald Trump subsequently used the NFL to "attack" part of American culture, said Lockhart. "We were faced with a situation of no good decisions," he added. "We didn’t want to do something perceived as disrespecting the flag, troops, or law enforcement, but we also didn’t want to do something that was perceived as muting people’s ability to exercise their First Amendment rights." Lockhart said the NFL had to pick the least-worst choice, and that was to side with its players, even though the league is, essentially, a trade association of 32 billionaire owners. "That was controversial among the owners, who had a conservative outlook on these issues," he said. "We came to the conclusion that we couldn’t pick a side." 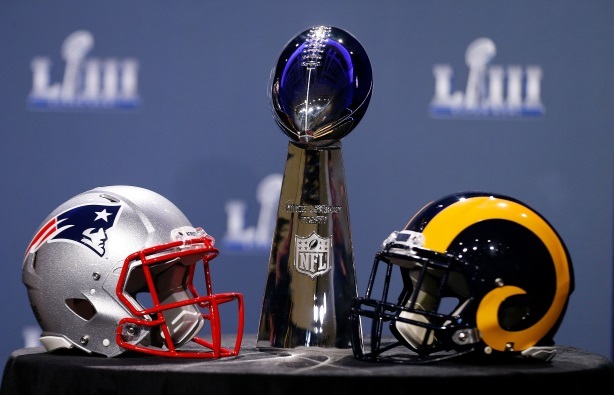 Despite further controversies this season such as the pass interference non-call in the Rams v New Orleans Saints NFC Championship game and several non-calls against the Patriots in Q4 of their Kansas City Chiefs AFC Championship clash, excitement is at fever pitch for Sunday’s game. Controversial NFL commissioner Roger Goodell took predictable heat as usual in his pregame press conference this week, but he is to a certain extent between a rock and a hard place in his ability to be able to address issues such as this. He’ll never please anyone and his reputation is so compromised that it is probably beyond repair at this stage. Attention will also focus on the brand wars surrounding the big game, epitomized particularly this year by official sponsor Pepsi’s incursion onto deadly rival Coca-Cola’s home turf, as Sunday’s game is being played in Atlanta. Pepsi took over many out-of-home ad locations usually monopolized by Coke and activated some guerilla tactics to engage their bigger rival in the fizzy drinks category. Possibly contrary to some assumptions, the NFL estimates that 45% of football fans are female and made up about 49% of the more than 108 million people who watched the Super Bowl in 2018. Advertisers are tapping into this and more progressive attitudes to gender politics to target this key demographic, and these spots will be particularly worth watching on Sunday. At more than $5 million a pop, Super Bowl marketing strategies are always worth analyzing, and the tastemakers and pundits will be watching intently for breakout trends and activations. Brands also invest millions of dollars pregame in marketing their own marketing. As well as the Pepsi/Coke buzz, social listening and analytics company Talkwalker highlighted Bud Light’s promise of free beer to Los Angeles if the Rams win Super Bowl LIII and Verizon’s campaign honoring first responders who saved the lives of NFL players. My sense is the country simply wants to get back to basics and enjoy the biggest sporting day of the year unencumbered by politics, partisanship, controversy, and bone-chilling cold temperatures. Whether you’re pro-Brady or pro-Goff, let’s hope the players live up to the hype and deliver a game that chimes with the temperature gauge set by the nation. Would you name your baby Klondike...for a Klondike bar?